Ju, obg pela novidade anual e tanto capricho. Já fiz tantas receitas suas, e todas, sem exceção, deram certo. Tbm amo suas fotos, tudo tem uma cor bonita, uma luz boa, uma cara de limpeza e cuidado, realmente vc é demais! Halloween: múmias e fantasminhas, e vídeo novo no canal! a journalist from Brasilia, capital of Brazil, who discovered other passions in her life: cooking and photographing. I get more excited with a culinary book than shoes, make up or clothes. Read More. I’m a journalist with more passions than time can allow me to have. I have found in the kitchen my paradise, my resting place after a long and exhausting day. It’s my addiction, really. 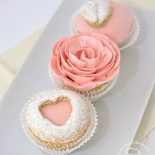 Not only cupcakes but anything that I find interesting, challenging or fun to do. Despite the blog’s name, it’s not all about cupcakes. I love cooking risotto, of all kinds, and I simply love any recipe with cheese. I’m not sure when or why I started to cook. My memories are of my mother putting me in the kitchen and teaching Brazilian white rice and her awesome pomodoro sauce for spaghetti, with fresh tomatoes just the way only she can do. All I know in the kitchen I’ve learned by one way: practice. My recipes are created from my head and implemented with the tests I run, or even meticulously measured from trusted sources. 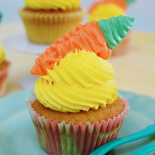 I have a true passion for cupcakes, because I believe they represent everything that’s good in the kitchen: butter, sugar, cuteness, dedication and creativity. Everything in the right amount for one person. I enjoy experimenting with these little ones, and finding out new ways do decorate them. 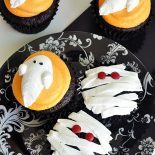 When I have nothing better to do, I start researching and studying recipes, theories and decorations for cupcakes. Yeah, study, that’s right. The blog is also a place for my second passion: photography. I’m that person who keeps looking for angles and shots while walking on the park. I also study the art of photography through websites and books. Cupcakeando means, roughly, cupcakeing in Portuguese. 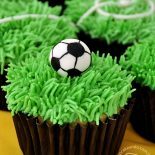 The noun “cupcake” is in a verb tense that most well-schooled Brazilians hate because it means an action that will never stop. That’s precisely my intention. I don’t have any wish to stop my cupcake factory anytime soon, or even stop cooking in general. If I don’t have anymore orders, it will be for friends. If my friends get sick of it, it will be for my family. When my family says “ENOUGH”, it will be for myself (and maybe for my Siberian husky and my Pembroke corgi). Because that’s what I love to do and what makes me truly happy. This work is licensed under aCreative Commons Attribution-NonCommercial-NoDerivs 3.0 Unported License. What if your question has already been answered on the FAQ? Read it just to make sure! Send your questions or doubts through here. I answer to each and every e-mail sent to me. Make sure you’ll get my e-mail by adding contato@cupcakeando.com.br to your safe contacts, or my answer might just flip into your spam box.